Shrewsbury – A recent trip to a postcard show, after a lapse of some 20+ years, resulted in the purchase of our photograph this week. The only visible connection to the town of Shrewsbury in this particular case was a stamped imprint on the reverse of this particular (unused) postcard, which reads “Herbert L. Buxton, Shrewsbury, Mass.” Herbert Buxton was a well-known storekeeper in the center of town. In addition to his business (fortunately for local history buffs!) he produced quite a number of postcard views of buildings, people, and other items of interest around the town in the era around 1910. 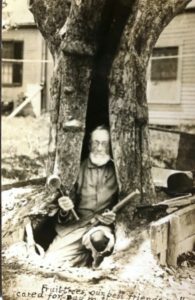 What particular significance this view might have had has been lost to the ages: we don’t know who the grizzled older man is, what the items he is holding might represent, nor do we know the location of the hollowed out tree. The handwritten note on the front of the card reads: “Fruit trees, our best friends, well cared for pay in the end.” If any readers might have some insight in to any of these things, please feel free to let us know. What we do know is that Herbert Buxton documented many views around our town that, without his pursuing this particular interest, would not have been passed down through the years to us in this present day.